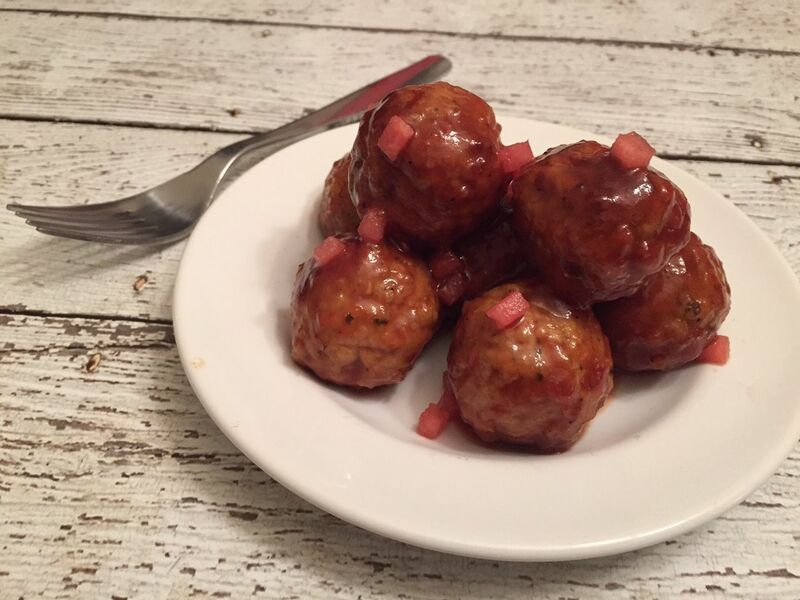 MY FINAL NEW YEAR’S RESOLUTION UPDATE: WATERMELON GLAZED MEATBALLS - What About Watermelon? While most people celebrate the New Year with a toast, or by sending fireworks into the air while thinking about what the next year will bring, my wife and I have a different way of celebrating. Each year, we create a smorgasbord of goodies that we enjoy as we count down to midnight. My wife creates a variety of snacks for this occasion, usually the kind of things you’d see at a football-watching party. Wings, dips, assorted cheeses and meats, and some sort of veggie platter that I usually avoid. This year, I’m pitching in by whipping up these Watermelon Glazed Meatballs for an appetizer. Since it’s a new addition to our New Year’s feast, I created a test batch this past weekend, and they made the cut as part of the starting line-up on December 31. Heat the oil in a large heavy sauté pan over medium high heat or electric skillet set on 325°F. Saute the mini meatballs until browned and hot. Reduce heat to low. Mix together the barbecue sauce and watermelon puree. Pour over the meatballs and simmer for a few minutes. Serve hot.